We have a very special update today with even more significant changes. This month (November, right? ), exactly one year ago, Slightly Deranged was unleashed to the masses. Which according to my calculations means the site is ONE YEAR OLD! Yay! That’s right, Happy Birthday, Deranged Ones! Anyway, you’ll notice there’s quite a few noticeable changes, namely a massive overhaul in the organization of content. I’ve unified everything related to games into its own distinct section, as well as movies. Those articles long enough to quality as reviews have been renamed to “Feature” so that you can distinguish them on the list. It’s looks rather nice; here, have a look. The book/game/movie of the month have been unified into these sections as well, but they’re all going to be featured with a thumbnail on the main page as usual. There’s been even more internal clean-ups which you probably won’t notice but I can assure you they make my life much easier. Of course, there’s still more to be done, but for the time being I believe this is a much cleaner layout. What to expect next? Stay tuned for my revisit of this first deranged past year, highlighting the most popular articles and movie clips! 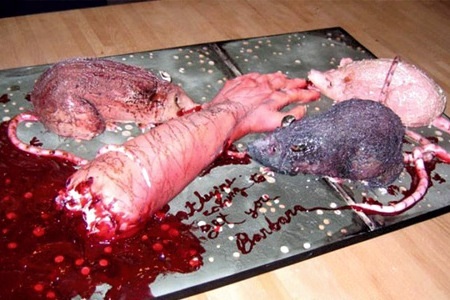 PS: I have no idea who did that cake, I simply googled for “really disgusting birthday cake”. You can’t imagine what I found. You are currently browsing the Slightly Deranged blog archives for November, 2010.